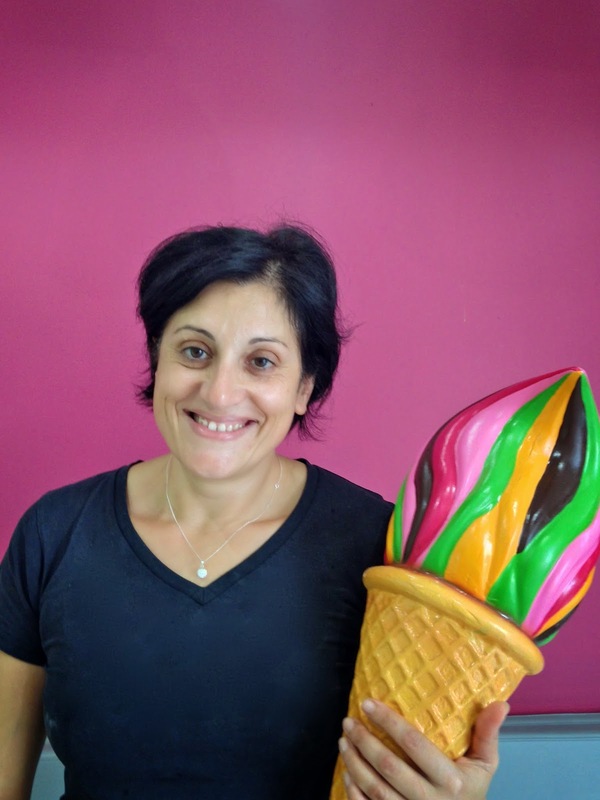 Diana Kontoprias, of Frangipani Gelato. It's summertime in Cronulla and the living is easy. With the warmer weather comes the crowds who are drawn to the area for the simple pleasure of being by the seaside on a sultry summer's day where there are breaks and points and beaches to suit all comers. When it comes time to turn your back on the curl of white sand at South Cronulla and dust off your bucket and spade, join the crush of visitors queuing at Frangipani Gelato Bar, located within a cluster of shops near to the train station. This gelateria focuses on a high-quality artisanal gelato with a rainbow of flavours that is as diverse as the crowds: it's elbow-to-elbow with teens flirting over which flavour to try; grandparents committing blatant acts of bribery; and the grommet brigade cooling their heels between surfs. Kontoprias was taught to make gelato by an Italian when she was living and working in Greece more than a decade ago. 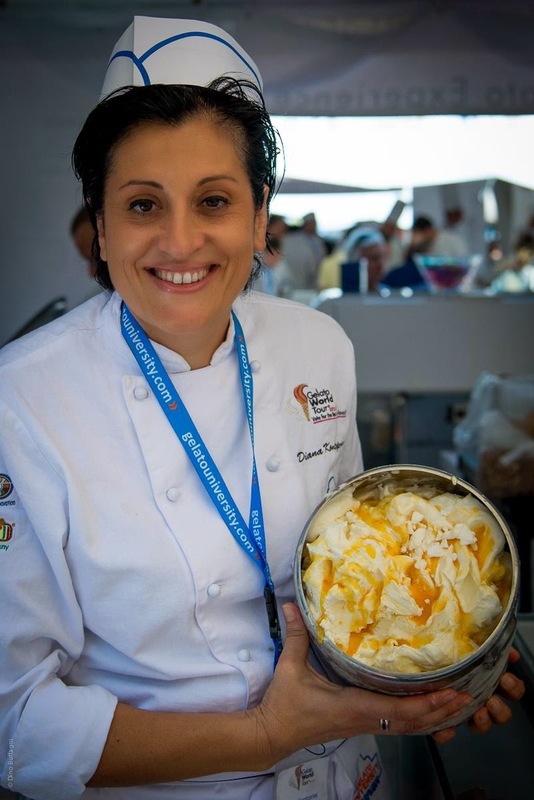 She has since gone on to scoop one gold and more than 20 silver medals at Sydney's Royal Easter Show, received third place in the Oceanic Australia and NZ division of the Gelato World Tour and a special award for her pavlova flavour at the global gelato event held in Rimmini, Italy in September, 2014. Kontoprias was joined in Italy by representatives from Gelato Messina (which has just opened its new premises at Westfield Miranda) as well as the Cow and the Moon, which went on to beat 23 other finalists from around the world. The three Australian teams were chosen out of 16 Australian and New Zealand competitors to travel to the finals in Italy. As one of the top three contenders at the Oceanic Australia global gelato event, Kontoprias was proud to have a crack at the world title with her Aussie-as pavlova flavour, which received a special mention as voted by her industry peers. Pavlova is the perfect summer flavour. "As a Greek-Australian the fact that I have received recognition for my artisan gelato is such an honour because I am competing against Italians who have been making gelato for generations. Frangipani is such a small artisan gelato shop and it holds its own against some heavyweights," says Kontoprias, who founded the gelateria in 2002. The pavlova-flavoured gelato, which features a meringue-flavoured base, passionfruit puree and meringue pieces folded throughout, was created just a year ago and has gone on to become Frangipani's fourth most popular flavour behind cookies, Snickers and salty caramel. Her award-winning formula adheres to the artisan principle of makes the creamy confection fresh every day using highest quality ingredients and she then tweaks the flavours according to her own taste. "Once I learnt the basics of making gelato I was free to experiment and that's what I love doing. I've been back to Italy to study the art of making gelati, but my approach is to be as experimental as possible and throw out the rule book when it comes to traditional flavours," says Kontoprias. The flavours change as different fruits come into season. This summer, Kontoprias says the hottest flavours are cool and refreshing, such as lime, coconut, raspberry coconut and toffee. She says the sorbets - which are essentially non-dairy gelati - are also really popular. Frangipani has recently had a facelift, with a berry-flavoured feature wall and pendant lamps illuminating the sleek gelato counter; coffee nuts should also note that Kontoprias is also obsessive about coffee, which is made using The Little Marionette boutique beans. Expect the gelateria to be smashed this weekend following Slam, the World's Largest Beach Volleyball Festival, to be held at South Cronulla Beach this Saturday, December 6. Savour the flavour of Frangipani Gelato, which is near to the Cronulla Train Station.